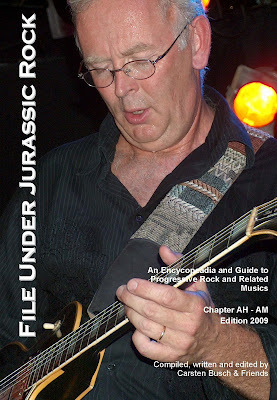 I'm proud to announce the first four parts of File Under Jurasic Rock that just have been published. Everything is downloadable from this blog or via the website. The book is entirely free as I figured that a properly printed version would be to expensive to produce (for now at least). Feel free to print it yourself (which is recommended, I don't like reading book on the computer myself) and enjoy! Any kind of feedback is highly appreciated. Really: any. Send an e-mail to the editor directly, leave a note on the blog or write something in the guestbook on the website. Any feedback is appreciated: what did you like, what not and what is missing or can be improved. And of course: feel free to contribute. 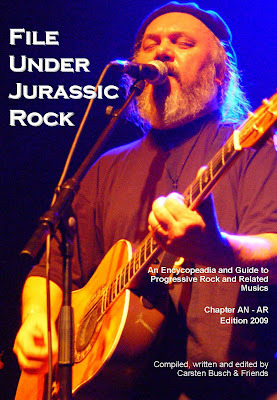 Missing information, pictures or (for bands and labels)material to listen and write. Introduction - 926 kB, 32 pages. The basic stuff: the book's goals, structure, definitions, etc. Chapter #-AG - 8 MB, 96 pages. Around 300 bands, 225 pictures, 170 reviews. Chapter AH-AM - 8,8 MB, 100 pages. Around 300 bands, 275 pictures, 150 reviews. Chapter AN-AR - 16 MB, 140 pages. 360 bands, 500 pictures, 265 reviews. Also I uploaded an improved version of File Under Symfo.